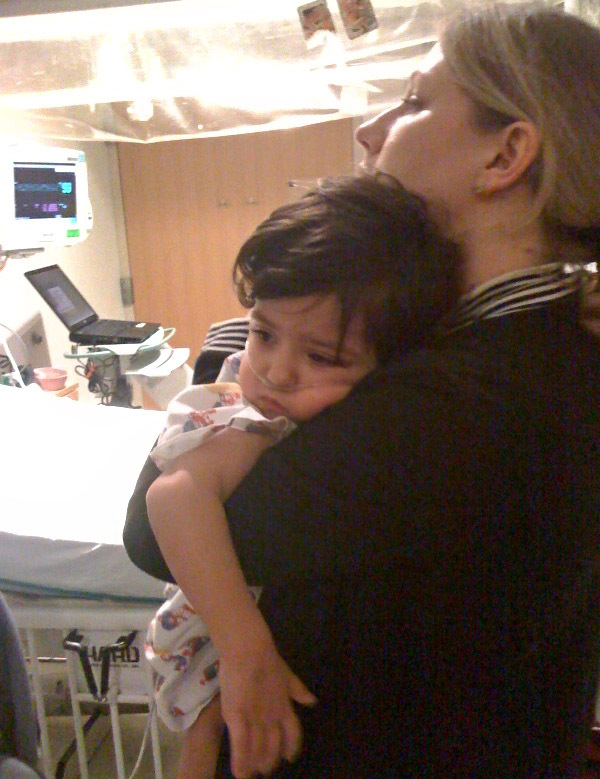 After realizing how much food Aiden was losing though the J-tube, the medical staff felt it would be very difficult to discharge him as he will constantly need the IV. Fortunately, his lungs are doing even better and he is weaned down to a 1-liter oxygen flow. On Monday, the anesthesiologists will review his status to determine if/when he is ready for surgery. His morphine doses have been increased and this has certainly made him more comfortable. However, at times he shakes. We are not sure if this is from the increased narcotics or something else. Additionally, the increased dosage keeps him awake and he is hardly getting any sleep. A week ago, he was hungry, dehydrated and was not getting enough sleep because of the pain which led to the thrashing that resulted in his IVs coming out. Oddly enough one week later it is the same set of problems but for different reasons: he does not get enough nutrition because of the increased leakage from the J-tube site and his sleep is reduced from the side effects of the narcotics. Fortunately, at least his pain has decreased. It has now been 33 days since Hannah and Aiden when to Boston. Last year, they were there for about 12 weeks in total (almost 25% of the year)! Even so, we are very grateful that we have the opportunity to ensure he gets the best medical treatment possible. His lungs have improved so much that the doctor thought she had the wrong patients x-rays. Talk about an answer to prayer! The medical staff is amazed at how quickly his lungs are healing. We know that his can only be because of the prayers that have gone up on his behalf. However, the problems with the J-tube site and open wound have increased. The leakage is so bad that he is losing nearly everything that goes into his stomach. This prevents him from not only getting food but fluids also. All day he has been asking for something to eat and is very hungry. As a result, he will be on IV all night to ensure he stays hydrated. Please pray that the doctors would have wisdom in terms of how to handle this. He simply cannot continue to not be fed as he has already lost weight and his body desperately needs the nutrition. Thanks again for all your prayers and encouraging words. Some of you have asked about sending Hannah a message, card, etc. and the fastest way to send a message is an e-mail (this is the 21st century after all!). Her e-mail is hannah@veritaz.com. He is certainly a little trooper. Fortunately, things have not gotten any worse. Unfortunately, things have not gotten too much better. While his lungs improve day to day, it will still take sometime before they are ready for the J-tube (removal) surgery. Other than that, no big changes today. His physicians discussed the possibility of him leaving the hospital in the next few days and coming back in a couple of weeks to surgically remove the J-tube. Of course, this is under the assumption that his lungs are completely healthy by then and that we have a way to control the pain. Fortunately, he is getting his full feeds into his stomach. Typically, this would cause him to vomit a great deal but since he is on morphine, there is not vomiting. For some reason, narcotics suppress his vomiting. In the past two years, every time he received narcotics the vomiting ceased. None of the physicians we mentioned this to can accurately determine why this is. Today, he was still in quite a bit of pain and even angry. Of course, he was being a bit naughty and had a Dr. Jekyll/Mr. Hyde combo going. Nevertheless, it is good to see him come out of his lethargic state. His poor little arms and legs are bruised from all the IVs. He has probably been poked over 20 times in the last week and has had to be physically restrained multiple times. Below is a picture of him that describes his attitude. Also, there is a short video clip of him saying “brave boy…brave boy.” The video was from a couple days ago. You will notice that he is in his stroller. This is because he refuses to leave it and will not stay in the bed. It seems that the stroller is his safety zone and he will not get out to walk or be held (unless he has nothing left to fight). The poor boy does not trust anyone and clings to his stroller no matter what. Update: 2/22 10:30PM Although there is still pneumonia, his lungs have improved and the air in the chest cavity seems to be resolving. Unfortunately, the wound around the j-tube site has worsened and become infected so they are treating it with antibiotics (he has been on course of four different anti-biotics). Additionally, this evening they moved him down to the floor as there was a shortage of beds in the ICU. For some unknown reason, his heart rate was quite high and he was breathing heavier than usual and this is one more thing to keep an eye on. He was able to tolerate his full feed through the stomach (g-tube) so he is finally getting nutrition after a week of no feeds. Overall, he is better but there are still many hurdles to cross. Please continue to pray for God’s healing power and also for Hannah’s strength as the constant care she provides is very exhausting. Update: 2/21 9:00PM Thanks so much for all your prayers. So many people have asked for updates and told us they were praying for him. His left lung is doing better. The air leakage and pneumonia have decreased and his breathing is better. However, the pain has sharply increased. In fact, it is so bad that one of the physicians said that he had never seen a child in so much pain. The problem is he can’t really tell us the specific point(s) of pain so helping him becomes a great challenge. This has caused him to be very angry toward everyone. The combination of lack of sleep, pain and drugs are taking a toll on his demeanor to the point where he screeches and grunts anytime someone comes near him. His voice is gone from all the screaming and crying so his noises of frustration/anger are reduced to a raspy moan. Despite all his hardships, Aiden has always been such a happy, lively individual but the situation has really taken a toll on his spirit. We are encouraged about the lungs but please pray that the source of pain would be determined so the medical staff can deal with it. Additionally, please pray that they would keep him in the ICU for now. The level of the care on the regular floor does not have the resources to handle him. Of course, the pain is still there and he still cannot pass anything. This prevents them from giving his regular feeds. Furthermore, they are very limited with the IV fluids as there are not many places left to poke him. Additionally, there are the lung issues and how to handle his long-term care. For the short-term, the plan is to nurse his left lung back to normal and then remove the intestinal feeding tube (J-tube). This is a surgical procedure and therefore cannot be done until his lung is healthy enough for him to be anesthetized. Thanks so much for your prayers. They really do make all the difference! 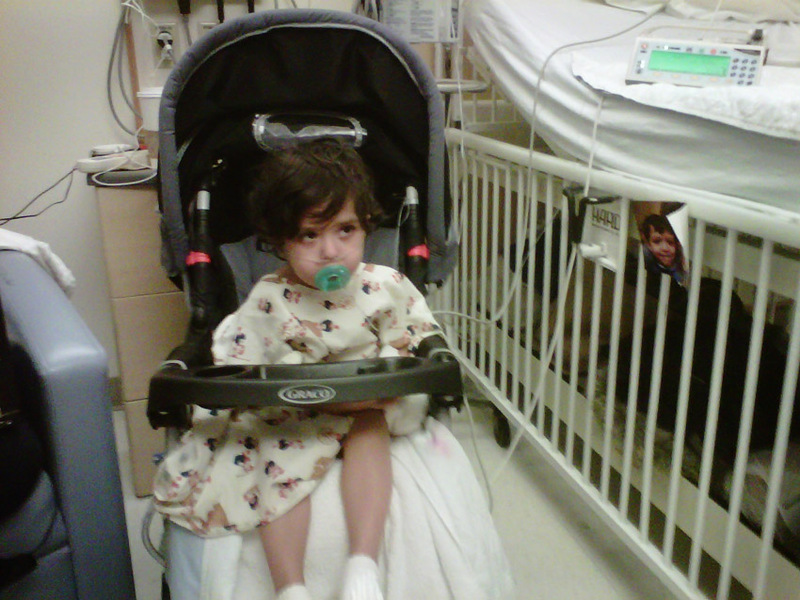 Update: 2/19 9:30AM – Aiden is finally being admitted into the ICU. His lungs look worse and he is very dehydrated as they are unable to find a good place to provide an IV (they can’t find a good vein to poke). Hannah was up all night and is very tired. Please keep them in your prayers. Update: 2/18 11:30PM: The situation has steadily deteriorated. On Tuesday, they tried desperately to get him to have a bowel movement with no success. He grunted and pushed but nothing moved. The pain was unbearable for him and he kept screaming and crying. The doctors have limited solutions and cannot find any type of obstruction that would cause this. In addition to not being able to pass anything, there is a tremendous amount of bile pooring out of the J-tube sight. So much that it is rapidly breaking apart the skin and causing it to bleed. His feeding has been stopped since Sunday and he is also getting dehydrated as his IV constantly keeps coming out from the thrashing he does because of the pain. They cannot do any tests on him until he passes the contrast and barium that is in his digestive tract. Of course, the problem is that they cannot get him to pass anything because of the obstruction (which they cannot diagnose until he passes it). This is a vicious cycle. And on top of all this his pneumonia in the left lung is causing several respiratory issues. Tonight’s chest X-ray showed that he developed a pneumathrax (air leaking into the space between the chest wall and the outer tissues of the lungs) and a pneumomediastinum (air leaking into the mediastinum-the space in the thoracic cavity behind the sternum and between the two pleural sacs containing the lungs). Although he is stable, if these leaks expand it could put him into a critical state. Given that his pneumonia has worsened, we have to keep a very watchful eye on him. Perhaps, worst of all, his spirit seems so diminished. He seldom smiles or laughs. He does not even want to put his shoes on to go for a walk or be held. In fact, he won’t even sleep in his bed. He will only stay in the stroller as that seems to be his comfort zone. Hannah managed to get him out just long enough for a picture (see below). Whenever he has to go through another procedure, he keeps saying over and over “brave boy…brave boy…brave boy.” It is heartbreaking to watch your child go through this. We are trying to get him in the ICU as soon as possible. Based on his history, more than likely he is going be there so we are pushing to get him in immediately. It has been said that “Man’s extremity is God’s opportunity.” We are praying to that end and ask that you would also. I haven’t stopped praying for Aiden since Jon told me on Saturday. I know your heart is tired of aching. Aiden is a brave boy and little fire. I will pray for your strength, Hannah, as you must be exhausted. Your patience will be noted by the doctors and nurses and you will be a testimony to the love of Christ, no matter what Aiden goes through. While I may be just a dentist, the mother in me wants to hug you through this. Please rest and remember to take care of yourself, so Aiden can awaken to your smile. Our little church up here in the north Georgia mountains loves that we have such a BIG GOD. He has been holding your whole family in the palm of his hand and doesn’t plan to let go. May his peace be with all of you. Thank you for all your updates. I’m really praying hard that God will give wisdom soon so that sweet Aiden can come home and be done with hospitals.